The Mayanot Blog: Jerusalem Snow Day! Having spent eight years living in Philadelphia and four years attending university in upstate New York, snow is something I’ve definitely grown accustomed to. Certainly, Northeast America as a whole is well equipped to deal with snow; we’ve got an appropriate arsenal of salt trucks and plows ready to go at the first signs of snow. Most families I know own a snow blower, and everyone is well stocked with coats, scarves, and winter boots. In short, it takes a pretty serious blizzard to slow things down back home. Israel, on the other hand, is – as you’d probably expect of a Middle-Eastern country – decidedly unprepared for anything resembling snow. About three weeks after I first arrived in Jerusalem last January, I got a taste of a Mediterranean winter: rain, rain, wind, and more rain. Snow chose not to show up. This winter, however, gave me what’s probably a rare opportunity to see how Jerusalem handles real snow. Spoiler Alert: Everything shuts down. The day before the forecasted snowfall I noticed things were a bit off throughout the city. People were unusually hurried, and dressed more heavily than normal, even though I wouldn’t have called the weather particularly cold. Walking to the mikvah for my morning dip, I saw a crowd of students from a nearby yeshiva standing outside, looking up at the sky and pointing, while a teacher angrily yelled at them to go back to class. My Hebrew isn’t good, but the context of the situation was pretty obvious – snow-craving Jerusalemite students don’t strike me as being especially focused on learning. Later that night, the snow finally made its grand appearance, accompanied by hail, thunder, and lightning. Once the ground was sufficiently coated white, several Mayanoters took the chance to go to the Old City and enjoy the majesty of a snow-covered Jerusalem. The following day, I couldn’t believe my eyes. 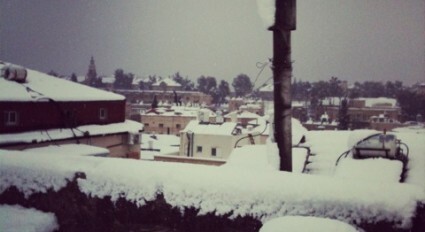 The rooftops were covered with a THICK layer of snow. Davidka Square was filled with parents and excited children building snowmen and throwing snowballs. The shops and streets were, of course, empty. Back at Mayanot some students took the chance to enjoy the weather outside, while others remained inside learning. After a quick walk around, I also returned to the toasty study hall. Most of the classes were cancelled, so I took the opportunity to catch up on my personal learning, a rare opportunity. In the evening, students gathered downstairs for an impromptu farbrengen. Singing songs and sharing stories, we reveled in Mayanot’s warm atmosphere of brotherhood and friendship, made all the warmer by a Jerusalem snow-day.